Old and new design is celebrated at The Kettle Black; a refined yet breezy cafe housed in a Victorian terrace, polished off with contemporary flourishes. A favourite of late sleepers and early lunchers alike, beautiful brunch spots have been popping up all about the place in recent years. The Kettle Black in South Melbourne is one such locale. From the team behind much-loved Melbourne eateries Higher Ground and Top Paddock is this space. 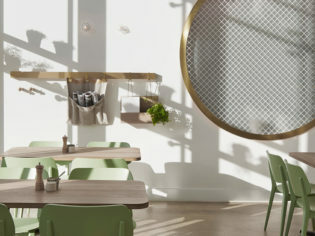 It’s more fine-dining-breakfast than humble cafe, yet the mood here is laid-back and breezy. The white-on-white heritage 1880s Victorian terrace looks somewhat awkwardly wedged beneath the modern Fifty Albert apartment building, but there’s nothing clumsy about the design. A mix of contemporary textures, from tiles to wood and polished concrete, sits comfortably next to original Victorian flourishes. “The old and new are seamlessly linked by the elegant playfulness of the foyer,” says Hana Hakim (formerly of Studio You Me and now of The Stella Collective). Restrained brass touches and accents of pistachio ice-cream green lend a serenity to the cafe. “The primary ambition was to create a feel-good space that was simple, well-crafted and honest,” says Hana. Put the kettle on – we’ll be stopping by!